It was exactly as he’d always envisioned palaces to be. Supported by columns, paintings and statues in every room, animal skins draped over sofas, gold doorknockers, a ceiling too high to touch. And more than that, it was people. So many people, striding down corridors. This way and that, attending to affairs or looking to shine. People from far and wide, from every corner of the earth, people from beyond the desert. Word of God there were even some who had seen the sea. And women who walked like leopards, and giant warriors, their faces decorated with scars; there were Indians and blacks; he actually saw a dwarf. Lobo sidled up to circles, he pricked up his ears, thirsting to learn. 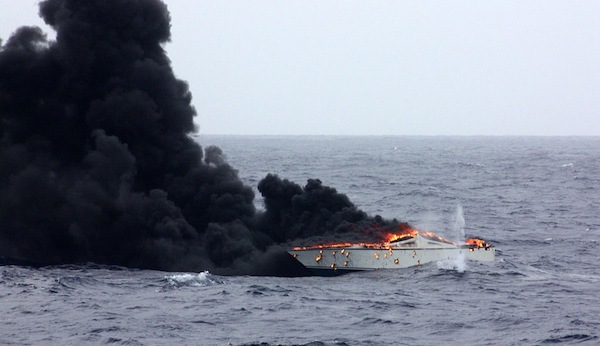 He heard tell of mountains, of jungles, of gulfs, of summits, in singsong accents entirely new to him: yesses like shesses, words with no esses, some whose tone soared up so high and sank so low it seemed each sentence was a journey: it was clear they were from nowhere near here. He’d been out this way long ago, when still with his parents. But back then it was a dump, a hellhole of waste and infection. No way to know it would become a beacon. The royalty of a king determined these things: the man had settled among simple folk and turned the filth to splendor. Approached from afar, the Palace exploded from the edge of the desert in a vast pageantry of gardens, gates and walls. A gleaming city on the fringes of a city in squalor, a city that seemed to reproduce its misfortune on street after street. Here, the people who came and went thrust their shoulders back with the air of those who know that theirs is a prosperous dominion. The Artist had to find a way to stay. He’d learned there was to be a party that night, set off for the Palace, and played his only card. The guards glanced at him like a stray dog. Didn’t even open their mouths. But the Artist recognized one from the cantina encounter and could tell that the man recognized him, too. Finding no good space for himself at the party he thought it better to wander among the guests. Until the music started and a sea of sombreros rose up, looking for action on the dance floor. Couples configured and the Artist found himself ricocheted from hips and elbows. Some fiesta, he thought. He’d scoot to one side and a couple would come at him in three quick steps, scoot to the other and the next one tripped him on a turn. Finally he managed to corner himself and take it in without getting in the way: so elegant, the sombreros; so suave, the violence with which those thighs pressed together; and so much gold, dripping off the guests. Awestruck, the question took him by surprise. The Artist turned and saw a blondish man, weathered and elegant, who sat in his chair giving him a What Do You Think? face. He nodded. The man pointed to an empty seat beside him and outstretched his hand. “I make songs,” the Artist replied. And no sooner was this out of his mouth than he sensed that he, too, could begin repeating, after his name: Artist, I make songs. Yes, indeed, it was a banquet. On every table was whiskey, rum, brandy, tequila, beer, and plenty of sotol; no one could complain about the hospitality. Girls in black miniskirts topped glasses the moment they were raised, or if you wanted you could go over to a table and pour as much as you liked. The promise of carne asada and roast kid hung in the air as well. A waitress put a beer in his hand, but he didn’t so much as touch it. The Jeweler leaned back in his chair, smug, and the Artist once more nodded and looked around. He felt no envy for the gold-worked belt buckles and snakeskin boots the guests had on, tho they were dazzling; but the outfits the musicians on stage wore, those were something else: black and white spur-print shirts with leather fringe. There by the band, close enough to make requests, he spotted the King, majesty chiseled into his stone cheekbones. He was laughing raucously with the two Lords flanking him, both of whom might have given the impression of power, but no, not the force or commanding air of the King. There was one more man at their table, one who’d also been there at the cantina the other day. Less elegant than the Lords, or more round-the-way: no sombrero, no buckle. Better be, if he’s the Heir, the Artist thought. Something in the Jeweler’s tone put the Artist on edge, and now he did not nod. The Jeweler seemed to sense this and changed the subject. Told him he made jewelry only to order, whatever his clients wanted, and that’s what you should do, too, Artist, make everyone look good. The Artist was about to respond when the guard who’d let him in approached. The Artist stood nervously and walked to the stage. On the way he sensed the shape and the scent of a different sort of woman but refused to turn his head and look, tho the heat lingered. He stood among the musicians, said Just follow my lead, and launched in. People already knew the story, but no one had ever sung it. He’d asked endless questions to find out what went down, to compose this song and present it to the King. It told of his mettle and his heart, put to the test in a hail of bullets, and had a happy ending not only for the King but also for the down-and-outs he kept under his wing. Beneath that enormous vaulted ceiling his voice projected, taking on depths it never had in the cantinas. He sung his song with the faith of a hymn, the certainty of a sermon, and above all he made sure it was catchy, so people would learn it with their feet and their hips, and so they, too, would sing it later. When he was done, the crowd showered him with whistles and applause, the elegant musicians clapped him on the back and the Lords accompanying the King headbobbed in contentment and pooched their lips in – the Artist hoped – envy. He climbed down to pay his respects. The King looked him in the eye and the Artist bowed his head. “I do my best, sir,” the Artist stammered. The Artist bowed again and followed the man, fit to burst into tears and blinded by bright lights and his future. Then he took a deep breath, said to himself, It’s really happening, and came back down to earth. That was when he remembered the silhouette that had caught his attention. He looked around. And at the same time, the man spoke. “Who does that one belong to?” The Artist pointed to a trussed-up girl to cover his tracks. And falling prey to an absurd panic, fearful of what he sensed was about to happen, but more fearful of succumbing to that other aroma, the Artist accepted the Girl’s delicate hand and allowed himself to be led from the hall. 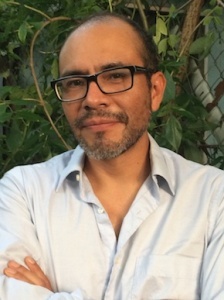 Yuri Herrera was born in Actopan, Mexico, in 1970. He studied Politics in Mexico, Creative Writing in El Paso, and took his PhD in literature at Berkeley. He teaches at the Tulane University in New Orleans. 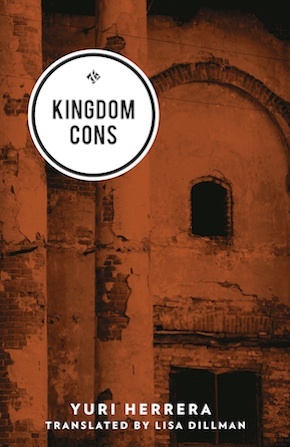 Kingdom Cons is published in paperback and eBook by And Other Stories, along with his acclaimed earlier novels Signs Preceding the End of the World and The Transmigration of Bodies. Lisa Dillman translates Spanish, Catalan and Latin American writers and teaches Spanish and Portuguese Literature at Emory University, Atlanta. Her translation of Yuri Herrera’s Signs Preceding the End of the World won Three Percent’s Best Translated Book Award 2016.